Tudyah Lake Provincial Park, on the southern shore of Tudyah Lake, offers a lakeside haven for travellers to MacKenzie or the Pine Pass. A good concrete boat launch gives access to fine fishing and water-skiing on the lake. The lake is also a convenient base for fishing on the nearby Parsnip River. Special Features: The site of Melville Lodge that was in operation in the 1960s. For safety reasons, firearms are not permitted in the park. Tudyah Lake Park is closed to hunting. No alcohol is allowed on the beach or in the day-use area. Located 9 km north of McLeod Lake on Highway 97. Tudyah Lake lies in a wide, open section of the Rocky Mountain Trench, just before highway 39 branches off toward Mackenzie. History: The property on Tudyah Lake which is now the Provincial Park, first assumed a role in recreation in the 1960’s when the Melville Lodge was in Operation. This resort provided cabins, camping and boat launch facilities and was very popular with Prince George and Mackenzie residents. In 1974, BC Hydro purchased this property, located within the reservoir basin, because of the possible effect of the Williston Reservoir at maximum full pool flooding. 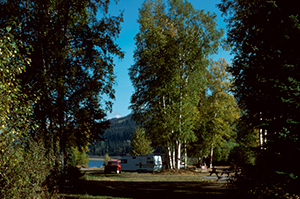 Public demand for maintaining recreational opportunities of this area was so strong that BC Hydro contracted a caretaker to maintain the campground, picnic area and boat launch. During this time public pressure for park development at this site grew and following considerable negotiations, a Provincial Park was established in August, 1981. Cultural Heritage: There are no known archaeological sites within the vicinity of Tudyah Lake Park. However, it is likely that the area was used by the Sekani Indians for hunting and fishing, with the waterways being used as travel and trade routes. Wildlife: Within the developed areas of the park, opportunities for viewing wildlife are limited. However, in the natural setting along the Pack River, wildlife such as beaver, otter, muskrat, moose, waterfowl and upland birds may be commonly observed. Although less conspicuous other animals expected to inhabit the area include deer, black bear, moose, wolves, coyotes and fox. Tudyah Lake supports a moderate to highly productive fishery with Rainbow trout and Dolly Varden as the popular sport species. Bear Creek has been noted as an important spawning area for trout. Lots of opportunity for canoeing or kayaking. There is good fishing on Tudyah Lake and also on the nearby Parsnip River. Anyone fishing or angling in British Columbia must have an appropriate licence. There are no developed trails at this park. Visitors should be cautious when adventuring into the backcountry/wilderness area. Safe swimming practices are a must! Visitors are encouraged to remain within the designated area. An abrupt drop-off is marked with floats. There are no lifeguards on duty at provincial parks. This park has waterskiing opportunities. There is a good concrete boat launch at this park that gives access to fine fishing and water-skiing. There is a mechanical hand water pump. This park offers open space vehicle accessible campsites on a first-come, first-served basis – campsite reservations are not accepted. BC Senior’s Rate (day after Labour Day to June 14 only): $7.50 per senior party/night. Read the User Fees Policy for information on Senior Camping Discounts.